I follow and read the Gadling travel site and often submit my favourite photo’s from my travels. Today was my 2nd “Photo of the Day” winning entry, so I’m stoked. The story behind this one is more being lucky and right place right time. We were wandering the markets of Chichicastenango (go there, its amazing) and noticed all the locals gathered around laughing and pointing. 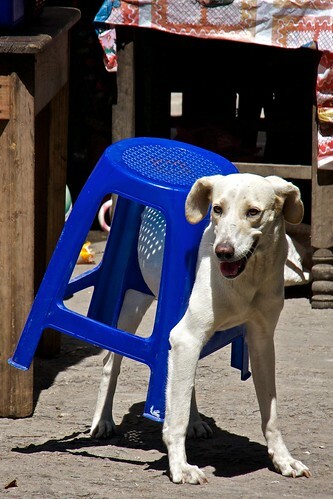 We of course joined in and it was this dog stuck in a plastic stool. It seems to be enjoying the whole experience and wouldn’t let anyone close enough to help. It kept running off. I was lucky enough to snap off a few frames before it disapeared with its stool. We only saw it for maybe 10 seconds before it was off. So, thats 2 winners so far. I really should get around to entering some more real competitions. Still overall very happy just to have people looking at, and enjoying my photo’s. On that note, I also got approached for one of my pics to be used in a elementary school textbook in Argentina. Having seen the quality (not good) of existing textbooks (in Korea at least) it was an emphatic YES. Can’t wait to see it.